My entire sharpening system cost me about $350…the most expensive item being the lapping plate, which retails around $200. I shouldn’t have to purchase anything else for a very long time. 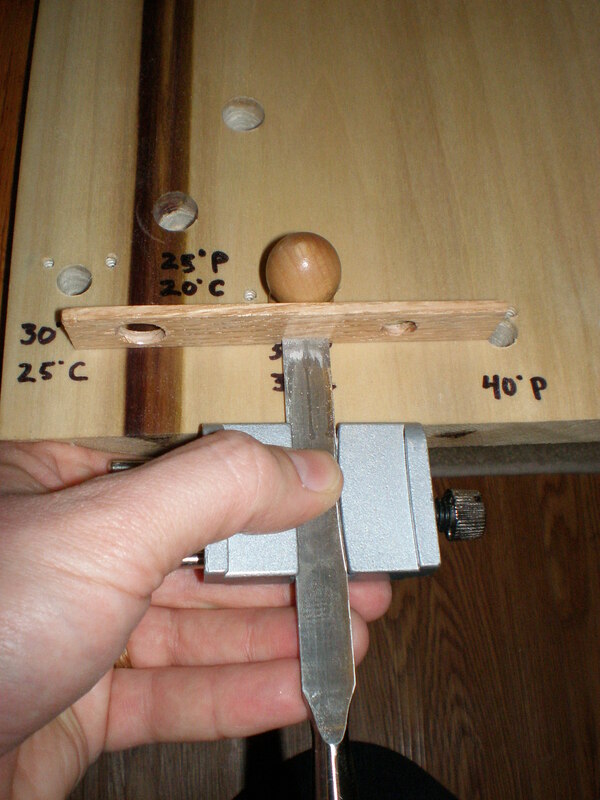 I find this to be the simplest way to sharpen plane blades and chisels. The waterstones seem to cut very quickly giving instant feedback to how the tool is sharpening. This is great for me because I seem to go offline quite a bit. I recently purchased the lapping plate, which has completely changed everything. Before the lapping plate, I would spend a great deal of time trying to flatten my water stones with sand paper and a flat surface. I would usually end up with a wasted piece of sand paper, a big mess, an un-flattened stone, and an angry demeanor. Now with the lapping plate, I can flatten the stones in 10-15 seconds and having truly flat water stones has increased the results of my sharpening tremendously. *Note: Whenever I am working on the stone I apply a couple of sprays of water from the spray bottle. 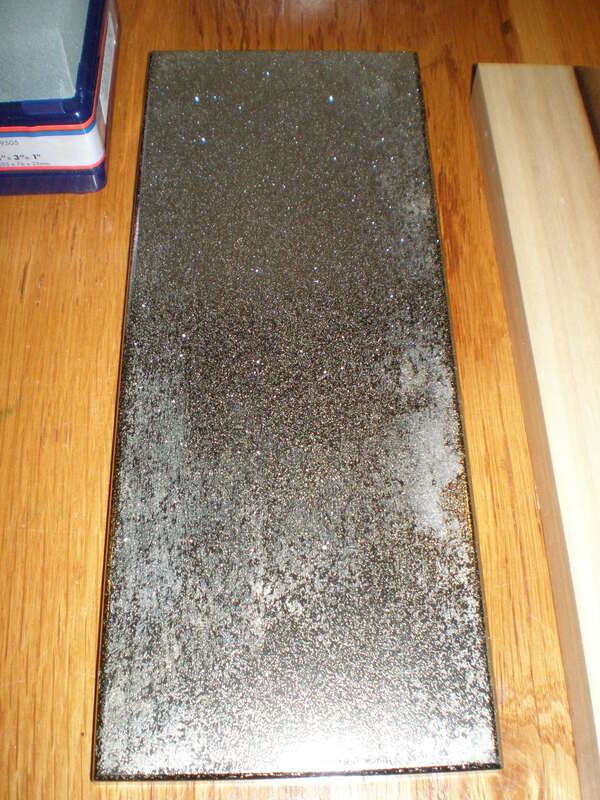 I also wipe off everything before switching to a different grit stone…including the honing guide. I also make sure to periodically re-flatten the stones with the lapping plate. I use the ‘ruler trick’ when flattening the back of plane blades. A simple search on the net for the ‘ruler trick’ should lead you to this technique. You can also check out the Lie Nielsen You Tube channel, where they have some great videos on sharpening. I have adopted a majority of their techniques here. 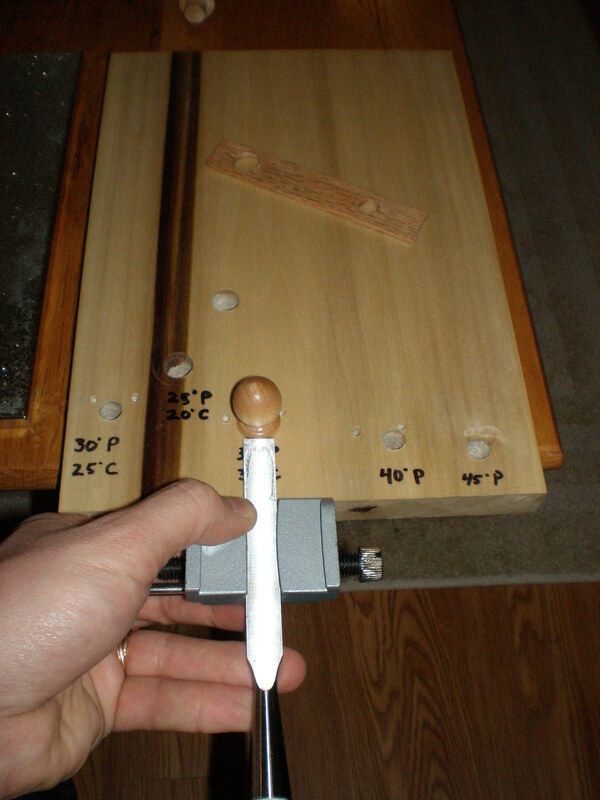 I built the angle setting jig based off of Lie Nielsen’s. You should be able to download a pdf of it here from their site. I tried to make it and failed…I couldn’t get the stops to line up where I wanted them, which is the reason my jig has decorative dowels instead. I just move the dowel to the angle setting that I need for the primary bevel angle. Then when I need to set the secondary bevel angle, I insert the shim between the dowel and the tool to be sharpened. Using this jig allows me to get consistent bevel angles each time I sharpen. When I receive a new tool or have a repair situation, I spend a little more time and effort. I like to start the same way…flattening stones. However, I start to flatten the back of the tool using the Dia-Flat lapping plate until I get the back of the tool perfectly flat. Depending upon how well the tool is made will determine how long this will take. I then work my way up through the 1000 and 8000 grit stones looking for consistent scratch patterns before progressing to the next grit. I repeat the process of progressing through the stones for the primary bevel…starting on the Dia-flat lapping plate and ending up on the 1000 grit stone. I’ll follow this same procedure if I have a tool that needs the primary bevel reshaped or repaired. Then I’ll set the secondary bevel on the 8000 grit stone. I have been researching sharpening for a long time, and I have tried many different systems and techniques. I really don’t understand why there are so many of them out there…it can be very confusing. After reading and trying so many of them, I came to the conclusion that I wanted something quick and simple, while at the same time having a system that would be low-cost to maintain. 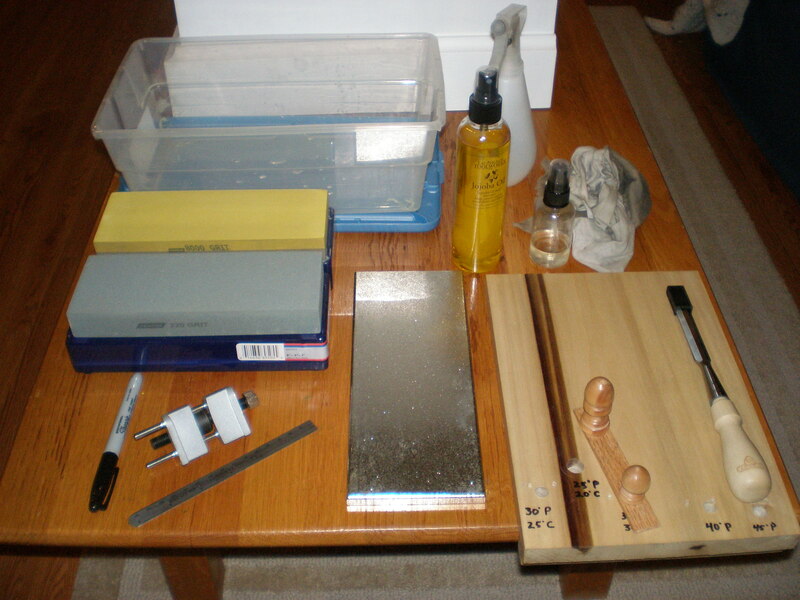 I didn’t want to have to purchase too many parts to the system (I have 2 stones, a lapping plate, and a honing guide), nor did I want to have to worry about continuing to buy consumables like sandpaper (I shouldn’t have to buy anything else). For me, this is the easiest I have tried and I am able to get great consistent results. 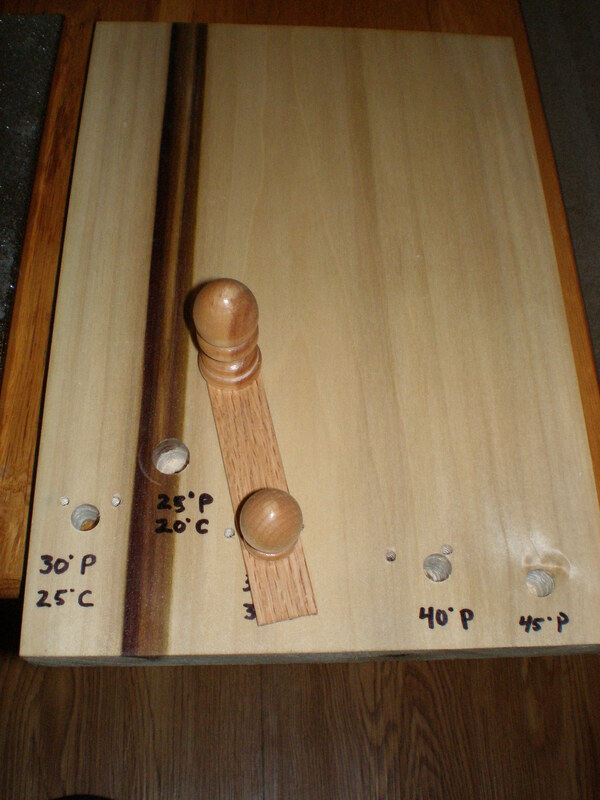 This entry was posted in hand tools, VCF, woodworking and tagged hand tools, sharpening, woodworking by villagecustomfurniture. Bookmark the permalink.